Over the years I’ve enjoyed many bottles of Italian Dolcetto wines. These are generally nice, every day wines that are available at wallet friendly prices. The Italian word “dolcetto” means “little sweet one”. Don’t take that literally since these wines are usually bone dry. Most are light to medium body, fairly fruity with a touch of spice. The moderate acidity makes it a wonderful partner to a wide range of food. This has 12.5% alcohol and is sealed with an agglomerated cork. 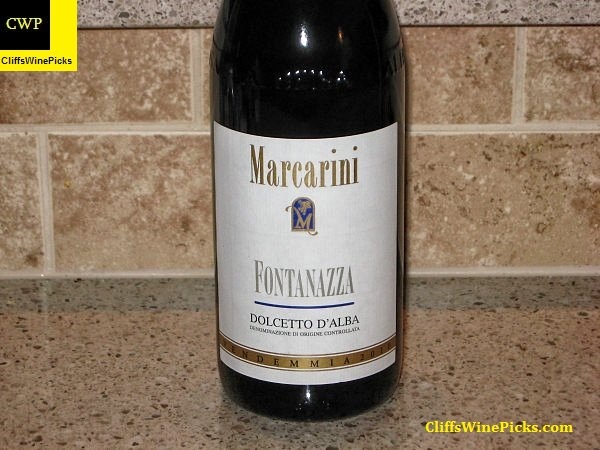 This Dolcetto d’Alba is a creation of the Langhe hills, La Morra Fontanazza in particular. A delicious, easy-drinking wine, it is a product of the terroir and the distinctive regional microclimate. An “honest” red wine, the “Fontanazza” is made in traditional manner, without the intervention of new technology. It has always been considered the everyday drinking wine of native Langhe people. The “Fontanazza” selection is not aged in oak in order to offer a fresh, fruity, inviting and easy-to-drink wine. “Fontanazza” presents a magnificent ruby-red color with lovely violet reflections. The intense and persistent nose offers floral and fruity sensations with evident signs of sweet spices. The palate is characterized by the same sensations, exalted by a pleasant acidity and a delicate, slightly bitter aftertaste. With these characteristics, the Dolcetto “Fontanazza” is an excellent companion to every dish of the Italian and international cooking tradition. The ideal wine glass has a medium-sized bowl and a long stem. The 2007 vintage of this wine was a show stopper for under $10. When the local received a small cache of the 2008 vintage and made it available for $10 via an e-mail offer, I had to grab a case. My first bottle wasn’t up to the level of the 2007, but it showed considerable promise. 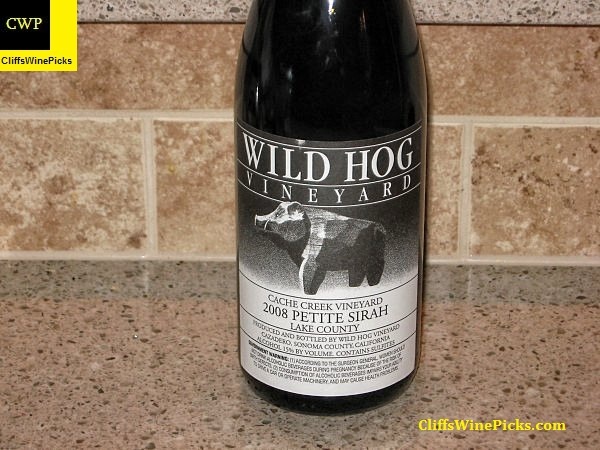 According to the Wild Hog website, this wine does not exist. For some reason there is no mention of this vintage. As a final word on the subject, this is included in the comments about the 2007 vintage, “Dark fruit and violets on the nose. Black berries, round feel and good tannins. It is big, firm and supple. And pretty smooth to boot. This is the last vintage of this wine.” Oh well, they may need to update the web site. The wine has 15.0% alcohol and is sealed with a natural cork. At Wild Hog Vineyard it is difficult to separate the wine from the winemaker. Daniel Schoenfeld began making wine as a home winemaker in 1977. He loved good food and wine and wanted to share his enjoyment with friends. He and Marion, his wife and co-owner, are both gardeners with a passionate belief in sustainable living. Marion tends a three acre organic garden which produces the vegetables and fruits that the family consumes. Daniel farms the five acre vineyard above the house. Together with their two children, Iris and Ariel, they harvest the bounty from the land. They take from the land only what they give in return. We have visited the Alexander Valley based Trentadue Winery a few times in the past and always had a good time and an even better tasting. This is a long time favorite wine in my house. The blend varies each vintage, this one is 49% Sangiovese, 27% Merlot, 8% Montepulciano, 8% Malbec, 7% Petite Sirah, and 1% Syrah. This wine has enough acidity from the Sangiovese to stand up to dishes with tomatoes but the other grapes lend enough body and oomph to stand up to meat. 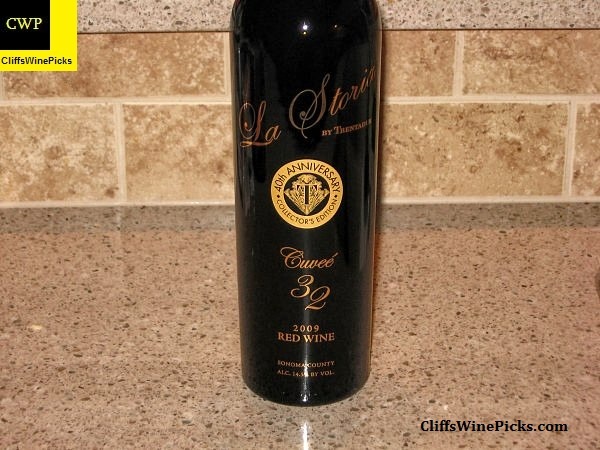 We like this wine with everything from pasta with meat sauce to Veal Parmesan and baked ziti. This has 14.5% alcohol and is sealed via a natural cork. The Trentadue family arrived in Sonoma County long before their region gained a reputation as the Wine Country. Life-long, hands-on agriculturists, Evelyn and Leo Trentadue contributed significantly to the advancement of their region over the years. In 1959, the Trentadues decided to flee the developers encroaching on their apricot and cherry orchards in Sunnyvale, the area known today around the world as Silicon Valley. To preserve their way of life, these hard-working Italian ranchers purchased 208 acres of land in Sonoma County’s then remote Alexander Valley. The owner/winemaker is Cody Wright, the son of well known and popular Oregon winemaker/owner Ken Wright. This was a new winery to me when the local wine store had an e-mail special on the wine. In my opinion, any time you can get hold of a good Pinot Noir for under $20, you buy. The wine has 13.5% alcohol and is sealed with a twist off closure. 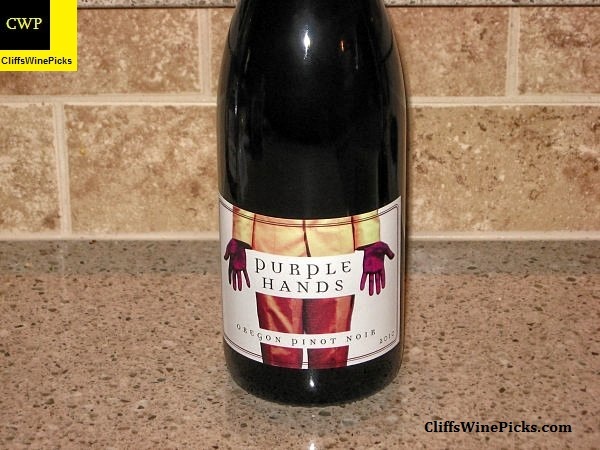 Purple Hands winery strives for the expression of genuine inherent terroir of soil and grape. We search for ideal moments of ripeness and complexity balanced with authentic strength of soil character. Our wines are windows into dynamic breadths of terroir, extracting and unlocking a code of sweet and savory from our rich Oregon soil.